At the first sign of spring, you were busy planning this year’s vacation. You always dream of taking a week or two off to spend some time on a beach in Mexico sipping Tecate, taking a week-long cruise ship to Alaska or a fun Disney Vacation. Instead, every year you wind up stuffing the family into your minivan and driving to Billings to visit her family. It wouldn’t be so bad, but her dad has never really warmed up to you and her mom’s spaghetti consists of Ragu sauce and pasta that she buys at the dollar store. At least you’re not in this alone, the kids have to suffer a week at their grandparent’s house as well. And this year, you are bringing the dog along so he can be miserable for a week. But don’t think that you can just toss Fido in the back and take off on an all-day road trip. No matter where you are headed for your vacation, you need to follow a few road rules when traveling with a pet. 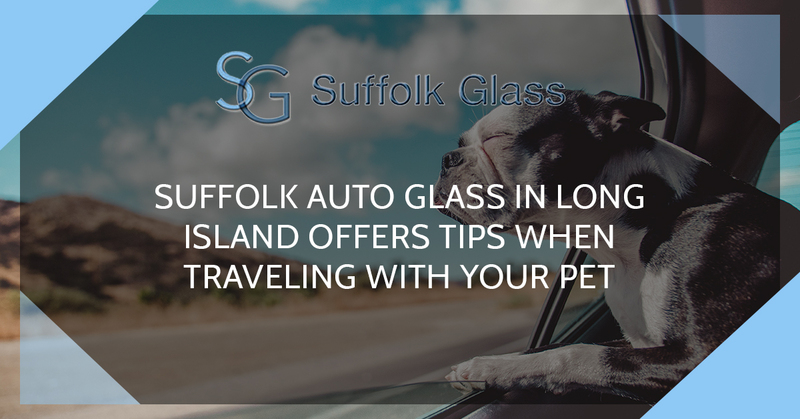 Suffolk Glass, your auto glass service in Long Island, offers you these handy tips when traveling with a pet. When pets are unfortunate enough to suffer a car accident, they suffer multiple injuries including broken bones, ruptured lungs and severe trauma if they are not properly restrained. Pets also injure themselves trying to jump out of open windows while the vehicle is moving. It is for these reasons that you want to keep your pet restrained. To help keep your dog or car from moving around in the vehicle, there are plenty of straps make just for pets on the market. Make sure you measure your pet to ensure you buy the right sized restraints. If restraining your pet is not an option, you can always by a crate. Crates are the best option to ensure your dog’safety when traveling as they are tested and durable. Again, measure your dog to determine the best size for him. Traveling with a dog is a lot like traveling with children. If you are trying to push yourself by driving for hours, you are leaving yourself open for a huge accident. Different dogs have different needs, but in the end, they all need to take a bathroom break and time to stretch their legs at some point. Even if you can keep going for hours on end, your dog can’t, so do him a favor and take frequent breaks from the road. Your dog needs regular access to water, even when you are traveling down the road at 75 mph. Always have a bottle of water ready to pour into a small bowl at regular intervals so Fido can get a drink should he desire. If your vehicle has power windows, it is quite easy for your pet to accidentally open them with their paws. You might think this is no big deal, but an overexcited dog will jump out of the window. And even if they don’t mean to, they can slip and fall out of the window of a moving vehicle. You should also know that many states have laws that don’t allow you to have a dog in your lap when driving. And even if there aren’t any laws against it, it is still dangerous and should be avoided. Lastly, never leave your dog locked in the car by himself, no matter what the temperature is outside. Before you load up the family for that trip to Montana, contact Suffolk Glass and have your windshield inspected.